The launch of the Soyuz MS-11 spacecraft is scheduled on December 3, 2018 from the Russian-leased Kazakh Baikonur cosmodrome. BAIKONUR(KAZAKHSTAN): Astronauts set to board the first manned space mission since an unprecedented accident aboard Russia’s Soyuz, on Sunday brushed aside safety concerns, saying they were ready to take risks. 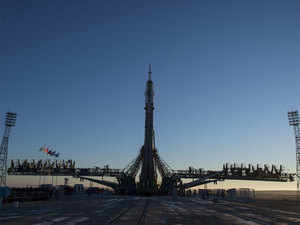 Oleg Kononenko of Roscosmos, Anne McClain of NASA and David Saint-Jacques of the Canadian Space Agency will launch to the International Space Station (ISS) from Baikonur in Kazakhstan on Monday. They will head to the ISS after a Soyuz rocket carrying Russia’s Aleksey Ovchinin and US astronaut Nick Hague failed on October 11 just minutes after blast-off. The pair escaped unharmed, but the failed launch was the first such incident in Russia’s post-Soviet history and a new setback for the country’s once proud space industry. The crew heading to the ISS dismissed any possible concerns about their safety. “Risk is part of our profession,” crew commander Oleg Kononenko told a news conference at Baikonur, adding they “absolutely” trusted teams preparing them for the flight. “We are psychologically and technically prepared for blast-off and any situation which, God forbid, may occur on board,” the 54-year-old said. Anne McClain, a 39-year-old former military pilot, struck a similar note. “We feel very ready for it,” she said. Canada’s Saint-Jacques added that Soyuz spacecraft was “incredibly safe,” noting it was “actually reassuring” to witness the October aborted launch from Baikonur. The accident highlighted the “smart design of the Soyuz and the incredible work that the search and rescue people here on the ground are ready to do every launch,” the 48-year-old said. Russia said last month the launch of the Soyuz rocket failed because of a sensor that was damaged during assembly at the Baikonur cosmodrome. But officials insisted the spacecraft remains reliable. Saint-Jacques will be the first Canadian astronaut to visit the space station since Chris Hadfield, who recorded a version of David Bowie’s Space Oddity classic aboard the ISS in 2013. Canada’s governor general and former astronaut Julie Payette is expected to be among dignitaries to watch Monday’s launch. Of the trio set to reach the ISS six hours after blastoff, both Saint-Jacques and McClain will fly for the first time. Kononenko is beginning his fourth mission to add to an impressive 533 days in space. NASA’s McClain was deployed to Iraq and represented the United States women’s national rugby union team in the past.